I like to try new things when we’re having friends for dinner, and since my friend last night eats seafood, but not meat, it was a perfect chance to craft this really wonderful cioppino, which is an Italian-American seafood soup that comes from San Francisco. Don’t be deterred by a long list of ingredients. I know my friend Susan is already checking this one OFF her list because it’s too long. But really, you break it into two parts – first, creating the soup/sauce; second, simmering the seafood in it – and it’s pretty easy. Start by cooking the onions in the olive oil with the spices… …and then add the garlic, peppers and tomato paste and cook for just another minute. Pour in the wine and let it reduce by half… …before adding the crushed tomatoes. Let it all simmer together for about an hour, with the lid on. and then you’re ready to add your seafood. Since I had company for dinner I had prepared the soup portion ahead of time, then just brought it to a light boil before adding all the seafood – mussels, halibut chunks, pieces of king crab that I had removed from the shells to make eating it easier at the table, and shrimp (peeled and deveined). It only takes about 5-10 minutes for the seafood to cook and the mussels to fully open and you’re ready to serve this with nice crusty bread. Or my foccacia which I’ll post later this week! This soup has a slight kick to it from the red pepper flakes – if you’re sensitive to anything spicy, reduce or eliminate it and you should be fine! Heat oil in a deep skillet or Dutch oven over medium high heat. 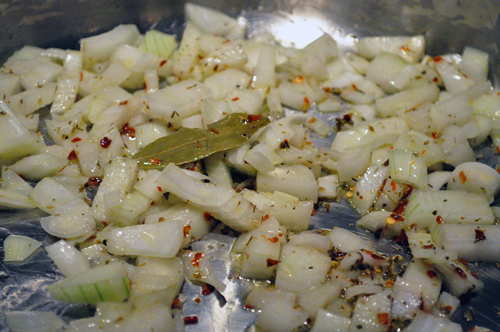 Add onions, bay leaf, oregano, red pepper flakes, salt and pepper and cook until onion is translucent, about 5 minutes. 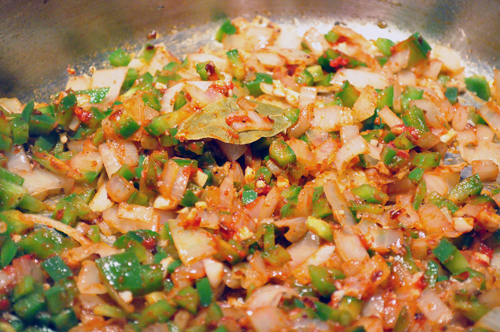 Add garlic, green pepper and tomato paste and stir together for 2 minutes. Add red and white wine and simmer until reduced by half. 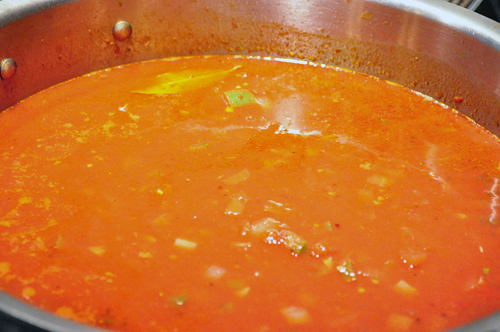 Add chicken stock and clam juice, along with crushed tomatoes. 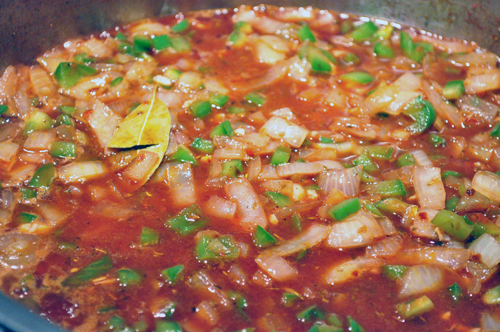 Bring to a boil and reduce to simmer. Cover and cook for 30-60 minutes. Stir in basil and parsley and add seafood. 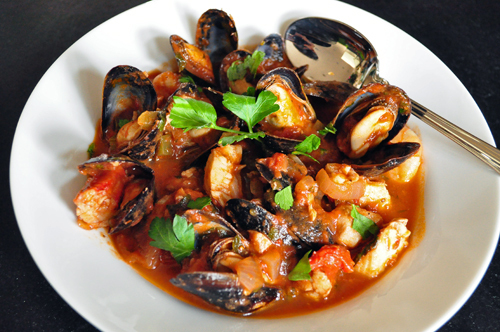 Increase heat to bring to a simmer and cook until seafood is cooked through and mussels have opened, about 5-10 minutes. I love chioppino and yours looks really good! I have been wanting to make cioppino for so long! It’s one of my favorite dishes and yours looks so delicious. Can’t wait for your focaccia recipe! That looks amazing. Thanks so much for sharing! We will certainly try it soon. This sounds wonderful. I’ve ordered it in restaurants a couple of times, but have never made it. Long ingredient lists are an excuse for me to roll up my sleeves! 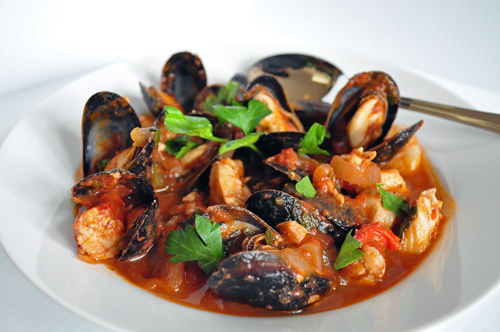 I love cioppino! I do have a question – in your list of ingredients you do not mention how large of a can of crushed tomatoes to add to the broth. I’m assuming it’s one of those 28 oz. cans, but would like to be sure! Monica, thanks for catching my error – it happens! 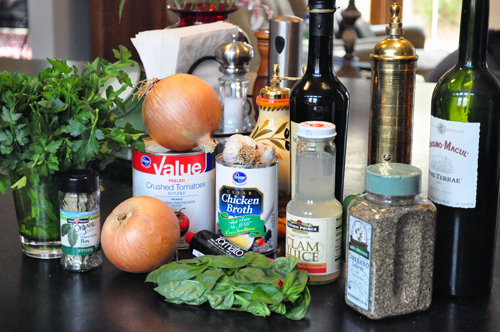 I actually had forgotten to include the can of tomatoes at all in my ingredient list, even though I show it in the ingredient photo and talk about adding it! I’ve corrected the recipe and re-posted. THX!